As a parent of multiples, you’re bound to experience a wide spectrum of emotions from the moment you learn that you’re expecting twins. Once your double bundle of joy arrives, twin moms and dads often feel extra blessed, and extra stressed, all at once. And, while parents of singles commonly complain about the onslaught of advice they are given by everyone they meet, moms of multiples are less likely to know many others who can offer first-hand words of wisdom. After all, recent statistics indicate that twin births only occur about 3% of the time. Our list of must-haves for twins aims to make your job a little easier. 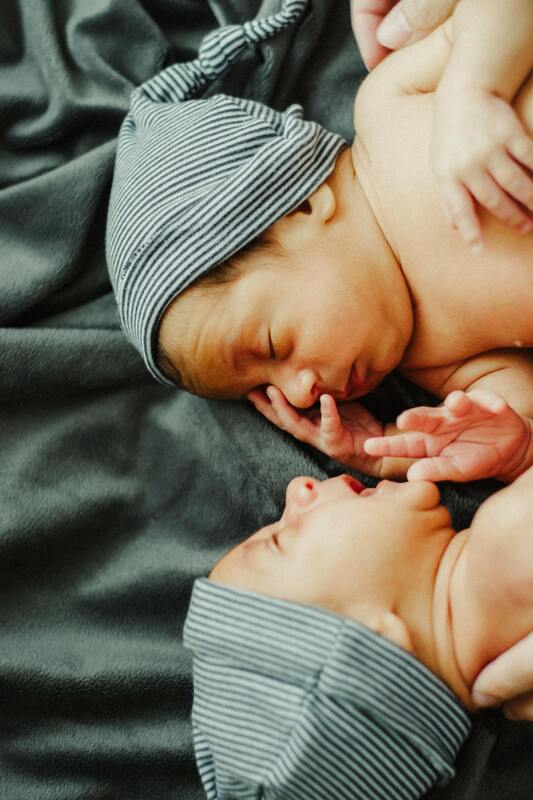 Read on to find out which items you can’t live without during your twins’ first year! When you become a parent of two little ones at once, suddenly your life takes an unexpected turn. You’re greeted with double the joy, or perhaps double the tears, depending on the moment. Certainly, your precious babes are the light of your life. But, having two new babies on board also presents a fair share of unique struggles that aren’t shared by every other mom and dad you know. While you can’t escape the challenges that their first year will bring. You can make these early days easier to endure. Having the right baby gear for your twins will help a lot. Here’s a list of the coolest must-haves you’ll need the most. All babies crave the closeness of your skin, and your twins will be no different. An attachable baby carrier is essential for short strolls, and perhaps even doing light housework. You can find these in a variety of styles including slings, front and back baby carriers, and side-by-side compartments for holding your tykes. The closer and more visible that they are to one another can be a helpful way to keep each other entertained. But, the most important thing to look for in a carrier is the comfort. Choose the style that’s most comfortable and natural-feeling to you and you are sure to get plenty of use out of your purchase. You won’t want to buy two of everything. But, you will definitely want two bouncer seats (or a double bouncer) to relieve you of your duties long enough to make a trip to the bathroom or answer the phone every once in a while. There’s only one thing to say about a double stroller or pushchair: don’t leave home without it. This page has a wide selection of the latest trending styles for twin moms to choose from. A convertible pack and play gives babies a resting place, feeding place, and play place all in one. It can be a lifesaver when you’re trying to catch a tv program or fold a load of laundry without losing your mind. A double bassinet on wheels means that you can keep a watchful eye on your baby buntings without having to wake them, even when moving about the house from room to room. Arranging a diaper delivery service should be a top priority for every expectant mom of twin babes. It will save you countless trips to the store during your babies’ first year. Plus, planning ahead for the cost of diapers can make it a lot easier to balance your family budget. Sure, it’s cute to dress your sweet little darlings in matching outfits. But, visitors will appreciate having a visual cue to separate the two, especially during their earliest days. And, you might feel the same after a week or two of sleepless nights as well. When buying car seats, don’t choose a heavy, bulky or hard-to-maneuver model. That’s just setting yourself up for extra work and double the frustration. After all, you’ll probably have to lug these around quite a bit during babies’ first year. An extra light model car seat will be one of the best things that you can do for your back. Today’s baby bags come in so many cute styles and colors. But, don’t be tempted by the cutesy trends. Go for efficient compartments, lightweight, washable material, and a comfy strap when picking out a diaper/baby bag. Unless you are dead-set against pacifiers for your babies (some moms are), then you probably want to stock up on a variety of different styles. What one babe prefers, the other might resist. And, you’ll want to have the paci that each one loves the very most during those trying times. Looking For More Ways to Make Your Little Ones Smile? Once you’ve checked off our list of must-haves for twins, you can move on to buying some of the fun stuff. One thing you’ll be quick to notice as a new mom is how much little ears love the sound of music. Looking for some tunes to keep your twinsies entertained? Check out this post for a collection of Yo Gabba Gabba songs that every baby loves!